When last we met the Four Thieves Vinegar collective -- a group of anarchist scientists who combine free/open chemistry with open source hardware in response to shkrelic gouging by pharma companies -- they were announcing the epipencil, a $30 DIY alternative to the Epipen, Mylan's poster-child for price-gouging and profiteering on human misery. It's been two years since the epipencil and Four Thieves has been been busy. 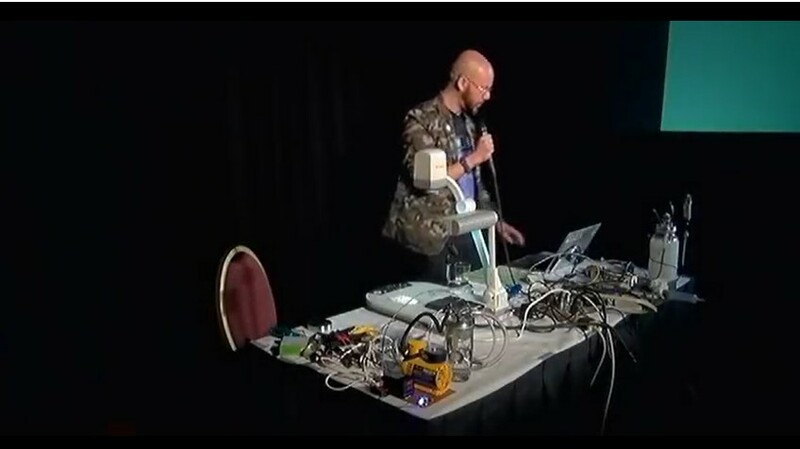 Michael Laufer is one of the founding Four Thieves, and he's just presented a wide-ranging look at the Collective's technical accomplishments at HOPE, the Hackers on Planet Earth conference held every two years at New York's Hotel Pennsylvania. Their main accomplishments involve the Apothecary Microlab, a DIY automated chemistry robot that you download and 3D print and assemble, using common hardware, electronics, and chemistry components. With the Microlab and the right chemicals, you can synthesize a variety of lifesaving drugs. Home pharma manufacturing is not without risks -- you could easily end up making poison instead of medicine. But as Daniel Oberhaus points out in his Motherboard profile of Laufer, the Four Thieves have made amazing strides in harm reduction in drug synthesis. Using a database from a startup called Chematica, they mined 250 years' worth of organic chemistry history to find the safest-possible synthesis paths to the molecules they were trying to synthesize (unfortunately, Merck bought out Chematica and took the database proprietary, though there's a darkweb site with a password-protected, leaked version of the Chematica database that Laufer would like your help in breaking). Right now, the Microlab can produce five drugs, including Naloxone (which saves the lives of people dying of opiod overdoses, and which uses oxymorphone bought on the street as a precursor, "making medicine from poison"); and cabotegravir (an experimental drug that prevents the spread of HIV from needle-sharing, which the collective makes available to heroin dealers to cut their products with). They've got all kinds of ambitious plans, too. They're investigating using books as a medium for growing GM mycelia that could devour the cellulose in the paper and produce precursors; these books could be mailed at media rates between biohackers in a postal P2P system they call "biotorrents" (they're also thinking of using CDs as petri dishes, taking advantage of standard mailers and packaging). They're planning a work-focus on rare and orphan disease, and blockbuster drugs like Solvadi, the $84,000, one-shot Hep C cure. The whole thing has the ring of OG hacker groups like Cult of the Dead Cow, as brilliant at media as they were at tech.